Tia Mowry Gets Real About Motherhood at 40: "I Don't Have Time for Mess"
"I'm just going to be really honest with you. Now that I'm 40, I don't have time for mess anymore," she shared with E! News' Justin Sylvester exclusively. "I know what I want. I know what I'm going after. I have a small group of friends because when you're younger, it's all about popularity but that doesn't matter for me now. It's about quality vs. quantity." Tia continued, "I feel happy in my skin. I feel confident and I feel like as you get older, you learn more about who you are and you embrace who you are and just go with the flow of life and go with the punches." That's not to say going from one to two kids is a walk in the park. While supporting her partnership with Office Depot, Tia was quick to admit that it's been an adjustment ever since her daughter Cairo arrived in May. "You know what I'm doing? Usually, I would say with just one kid, I'm taking one day at a time. But with two kids, I'm taking two steps at a time. I'm only looking as far as my two feet can go," she confessed. "I can't get so far ahead of myself or I'll get really, really overwhelmed. But you know what they say? It's harder to go from one to two as opposed to two to three but now I get it." 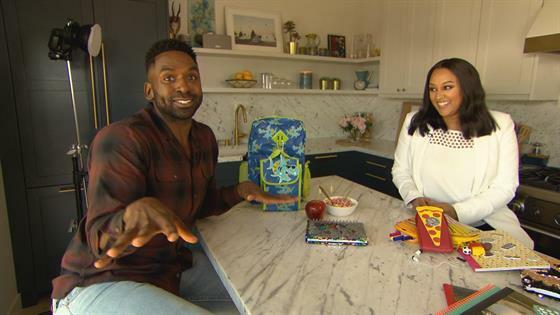 For the time being, Tia is focused on getting her seven-year-old son Cree ready for school again. In just a matter of weeks, he'll be entering second grade with plenty of the best school supplies from Office Depot. "It's all about making back to school fun and entertaining and hopefully that will translate into them making learning fun," Tia explained to us while showcasing some of her favorite items from the store. And in between getting ready for the school bell to ring, Tia is reminding fellow moms that there's no rush to get back into your best shape after kids. Instead of running to the gym after her daughter's May arrival, Tia has learned to simply go at your own pace. "I'm just taking my time and I'm also allowing women out there that you don't necessarily have to go back to yourself right away. It took you almost 10 months or a year to grow a baby. And it's going to take time for you to get back to yourself," she shared. "Do I think it's important to get back to yourself? Yes, I think it's very important to get back to feeling great, get back to feeling like you were before having a baby but I'm not so fixated on having my abs back and all that kind of stuff. I'm just taking my time."